With just how much emphasis The Walking Dead season 9 finale placed on its wintry conditions, it was a serious disconnect to see Alpha seemingly sunning it up in her only scene. 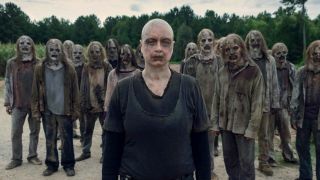 The Whisperers move around between the undead hordes at will, but surely them high-tailing it to warmer climes in such quick fashion was a bit too far-fetched, even for a show about zombies eating brains? Well, showrunner Angela Kang has cleared up any confusion – and it just might make the finale a more interesting re-watch in future. That clears that up. At some point during the creation of a new border by the Kingdom (featuring several disembodied heads on pikes) and the blizzard really hitting home, The Whisperers took leave and went south. It just wasn’t really explained during the events of the episode, which is why the sunny scene stuck out like a sore thumb. But, as Kang is keen to point out, it’s a concept that will play in to any potential The Walking Dead season 10 conflict. The fear of the unknown, even if we didn’t know it at the time, was present throughout Michonne, Ezekiel, and Daryl’s trek through the icy landscape. We, too, were fearful that a Whisperer would crop up at any moment but they weren’t even there. That’s good horror, let me tell you. Whisper it: The Walking Dead is scary again. And it’s all thanks to Alpha and her gang’s ability to crop up whenever and wherever, especially if you think they’re getting a tan. Shh, don't tell anyone: Here are the best new TV shows coming your way for the rest of 2019.